When I order beverages in restaurants and bars, I have a set of rules I abide by. This eliminates most of the sugary cocktails and “girly” drinks, thereby maintaining my trivial sense of pride. Rule #3 however is not without exception. Case in point? Dieu du Ciel’s Rosée d’Hibiscus, a bottle-fermented wheat beer infused with hibiscus flowers. This adds a delicate floral aroma and a distinct acidity to the brew. I’m also quite partial to the “Strawberry Angel” (aka. the “Dirty Ho”) served at the Pourhouse, Whyte Avenue. Half Früli, half Hoegarden. Try it - I dare you. Valentine’s Day is fast approaching. I myself am planning to spend it drinking chocolate stout and watching a predictable rom-com. This may not be an appropriate game plan for persons with significant others. Instead, advertise your domestic competence and impress your loved one by preparing a meal. The pomegranate, with its four chambers and blood-red juice is a perfect representation of the heart. Combine ingredients for vinaigrette and whisk to emulsify. Combine greens, pomegranate seeds, and prepared vinaigrette. Toss to coat with dressing. Roll goat cheese in pecans. 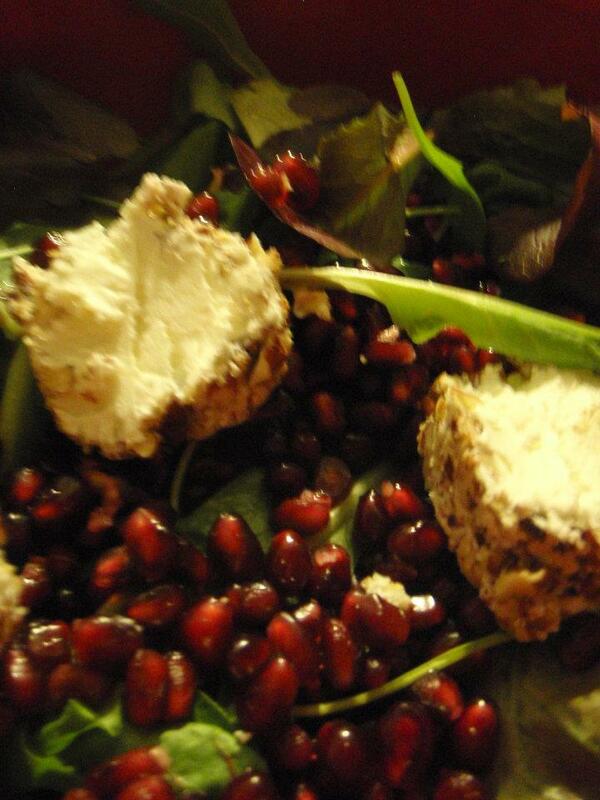 Top each salad with a round of pecan-crusted goat cheese and garnish with freshly ground black pepper. Note: This vinaigrette can also be prepared with chilled hibiscus flower tea or a zesty Hefeweizen. We received a request from Urbanspoon user "Victoria Stowe" (702717817@facebook.user) claiming that they are the author of A Bittersweet Finish. It sounds like you, but I'm writing to verify that this is the case and that you want to allow Victoria Stowe to manage your blog on Urbanspoon. That's me! Please approve this claim. Thanks, Vicky! I just approved your blog claim. Now your Urbanspoon profile picture is displayed on your blog page. You can upload a blog-specific photo if you prefer, and can change a few other blog settings there. Also, if you vote for a restaurant that you've reviewed on your blog, we now show your vote next to your post everywhere on our site.